We have been helping older people in Hangleton & Knoll for 10 years and the Event this year will be showcasing many of the groups who provide so much enjoyment and friendship to the local community. In particular there will be demonstrations from Cascadez Line Dancing, Singing for Better Health and SocialPing with the opportunity for anyone to dance-along, sing-along and ping-along. 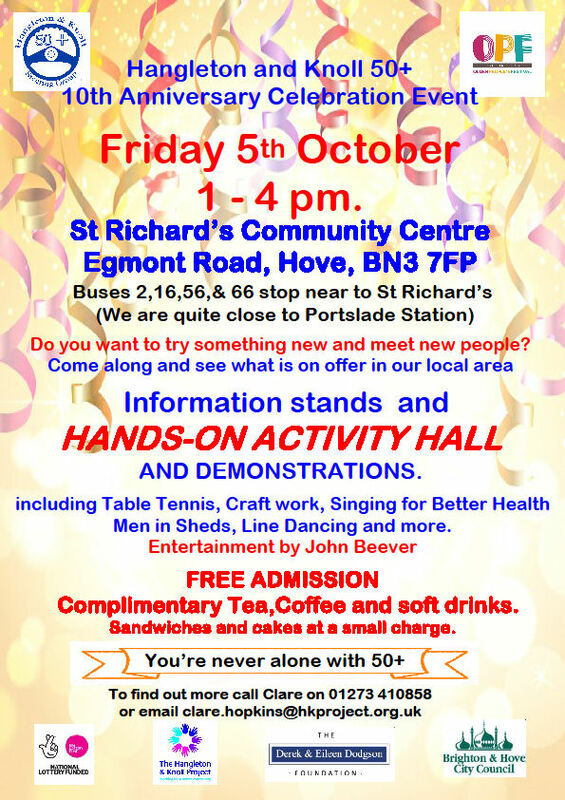 There will be stalls and demonstrations from Crafty Adults, the Benfield Wildlife, Men in Sheds, Dementia/Reminiscence, Multi-Cultural Women’s Group and many others. There will be a tombola for which people have already donated 80 prizes as well as free tea, coffee and soft drinks and delicious cakes at a small charge.